Butter four ramekins, and place them on a baking sheet. Combine the Parmesan, basil & parsley in a bowl. Crack two eggs into a bowl or cup, taking care not to break the yolks (this step is to make sure you don’t get shell in your ramekin. Don’t skip it.) Pour the two eggs into a ramekin and repeat for each ramekin. 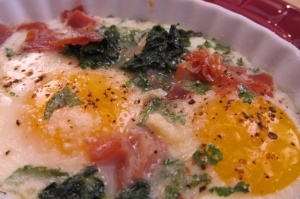 Sprinkle prosciutto, spinach and the cheese-herb blend evenly over the eggs. Top each ramekin with a pinch of salt and freshly ground pepper. Bake the eggs for 10-15 minutes until the eggs have achieved desired doneness: less time for runny yolks, more time for firm yolks. *Note: Shallow ramekins will cook faster than deeper ramekins.